I had occasion to travel to Melbun on business recently. My schedule was fairly tight, but in the end I arrived at my destination half an hour or so earlier than my appointment. And, as luck would have it, there was a bike share station right outside the door. Here was an opportunity I couldn’t pass up – I just had time for a quick ride! 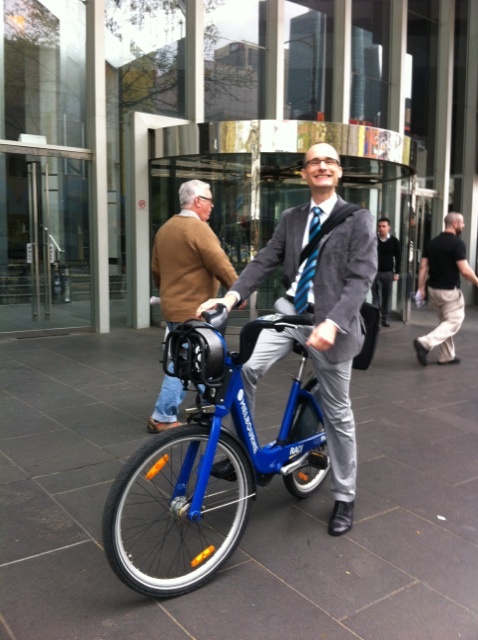 I have never had the opportunity to use a pubic bike share scheme before, so I was very excited. The whole thing is very easy to use. Stick in your credit card, agree to the 60(!) pages of terms and conditions (does anybody actually read them, I wonder? ), and then unlock your bike and off you go! It costs $2.70 for a day’s hire, which seems excellent value to me. Each ride has to be less than 30 minutes – the idea being that you hop from bike station to bike station throughout the day, rather than just getting one bike and riding around on it all day. Reviews I have seen of bike share scheme bikes tend to go on about how heavy and ponderous they are. I have to say, that didn’t really strike me. Clearly cruising around on a cargo bike for so long has inured me to big, heavy bikes. Indeed, I reckon the Melbourne bikes are lighter than the Radish, especially as I always seem to be carrying a whole load of locks, chains and straps in the panniers. Indeed, I thought they are very comfortable – the saddle height is easy to adjust, the ride position good and the handlebars are great. They have three gears, and they are not super-low (another thing I have read about bike share bikes). Sure, first gear is a real crawler, but up in third you can get a bit of speed up and bowl along. Upon doing this, however, I did discover that the brakes are not especially good. I’m not sure if the bike I chose was somewhat defective, or whether that’s just par for the course for roller brakes, but it was hard to effect much more than ‘gentle slowing’ without hauling on the levers for dear life. Overall, though I was very impressed. The whole thing just works really well. In my twenty-minute tootle around the block I went past two other bike stations, so there seems to be plenty of them around, at least in that part of the CBD. Plenty of bikes, but not plenty of riders. I didn’t see a single other bike share bike in use the whole time I was in Melbourne, and I’m pretty sure I was the only person who took a bike from that docking station that whole afternoon – I checked when I came down after my meeting, and the pattern of bikes and empty slots was exactly as it had been. This gels with the data – almost no-one is using this scheme. 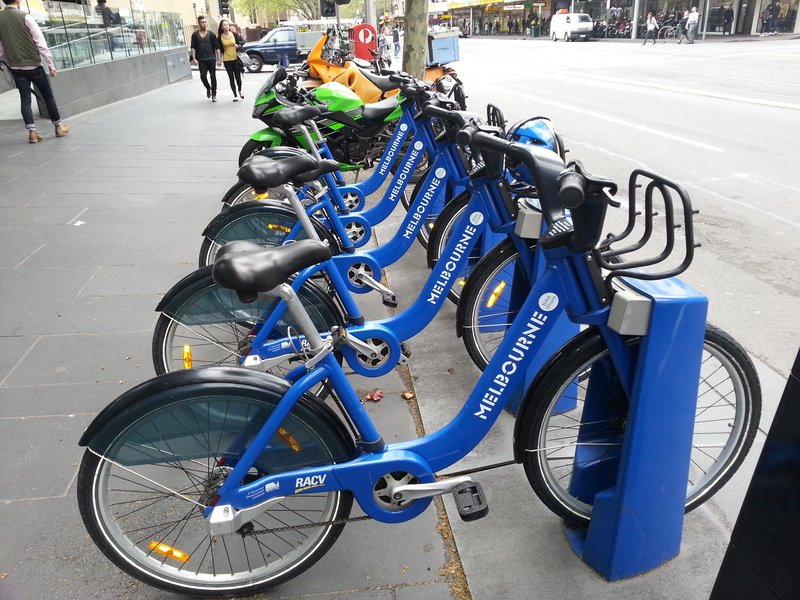 Yet the scheme is easy to use, the bikes are great, and there seems to be plenty of stations. In other cities around the world with comparable schemes – such as Dublin, or Toronto – they are extremely successful. So what is different in Melbourne? The answer stares you in the face as soon as you get onto one of these bikes. 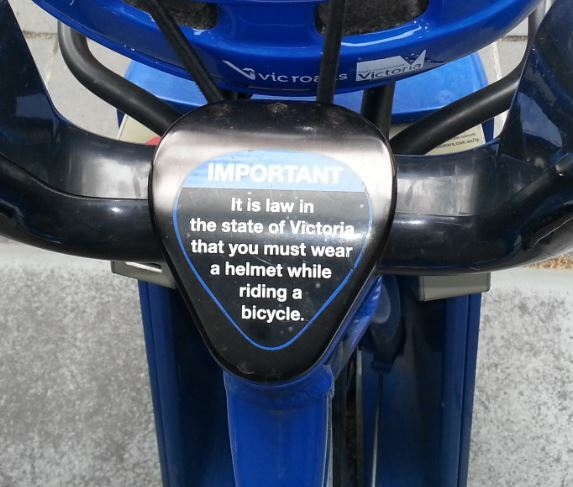 ‘It is the law in the state of Victoria that you must wear a helmet while riding a bicycle‘ states the bald notice on the handlebars. The docking station has a long list of shops you can buy a (subsidised) $5 helmet from, and indeed there are also a few free helmets on some of the bikes (there was one on the bike I hired). But the reality of this is that having to faff around with helmets, whether carrying one, buying one or using some skanky one left on the bike – is a major turn-off. Studies have shown that over two-thirds of people when questioned said that having to wear a helmet was the primary reason they did not use the bike share scheme. It’s just so sad, and so short-sighted. The safety record of these schemes is incredibly good – far better, in fact, than for regular bicycle riders. Yet the Victorian government (like most in Australia) cannot see beyond the dogma and refuse to budge on the issue, despite increasing numbers of voices (including those in local government) calling for a helmet exemption for bike share. It’s just so sad to see these fantastic bikes go unused for no good reason. Hopefully sense will prevail – because at the moment, the fine for not wearing a helmet in Victoria is the largest in Australia, at around $150. Did I wear a helmet for my ride? Of course not. But given the size of the fine and the legendary zealousness of the Victorian police on this issue, there were few others following my stance. Still, riding around the city on an upright bike wearing my suit I hope sent out some kind of message – this is the way it is supposed to be! A little while ago, I looked at the poppy, sunflower and rye version of these biscuits, and today I turn to the soy, linseed and sesame variety. Clearly Arnott’s are doing some sort of ‘trio of seeds’ thing with this range. I have to say, I wasn’t aware you could actually eat linseeds – I always thought they were designed for spreading on cricket bats, or something. Still, you learn something every day. 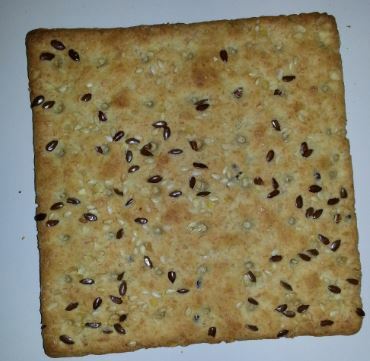 I wonder if it is the linseeds that are the black bits in the biscuit, making it appear at first glance as if your biscuit is crawling with ants? As far as they taste, well, you might as well just go and read my previous review, as these taste pretty much exactly the same. Frankly, I’m not sure the change in seeds is really doing very much. Which really doesn’t give me much to write about, does it? I did spread them with avocado this time, which was really quite yummy, but hardly newsworthy. I’d been toying with the question for a while – it’s something that is a growing trend amongst cyclists, as evidenced by the endless youtube footage if cars carving up cyclists. Should I get a camera for my bike? The main motivation for attaching a camera to one’s bike seems to be in order to capture bad driver behaviour and, if the worst comes to the worst, to use as evidence. I don’t suffer much from bad drivers, but I was vaguely curious try out a camera. So I bought one on eBay – a very very cheap one. 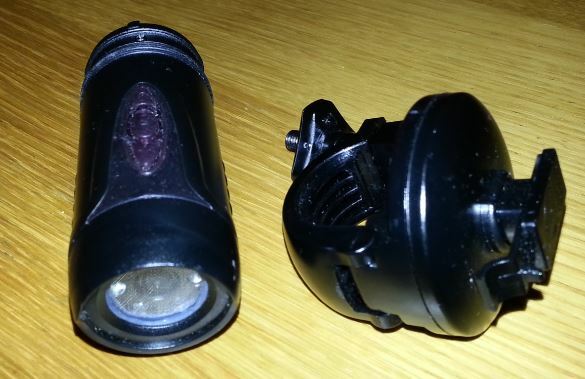 $20 from China, complete with handlebar clamp and integrated headlight. What’s not to like? Well, the video quality, obviously, but I thought I give it a go before splashing out on something expensive. So here, ladies and gentlemen, is an entirely uninteresting ten minutes of my commute – it’s the section through Sydney’s CBD on the green bike lanes. Probably the only interesting thing is the cycle cops on duty at Pyrmont Bridge (I spot them and push my bike through that section – it’s about three mins in), merrily giving out tickets to riders without helmets or those who ride through the red bicycle light at that spot (a bicycle light which, due to a wholly inadequate sensor, rarely turns green) whilst ignoring all those scofflaw pedestrians doing exactly the same thing. Oh, you’ll also see me ignoring a whole load of similarly useless bicycle traffic signals that give cars priority (any signal that only gives cyclists four seconds of green per phase is just asking to be ignored, IMO), whilst paying closer attention to those where pedestrians might be crossing. The other strange thing is the camera perspective – it seems to be quite a narrow angle, which gives the impression I am much closer to things than is really the case. At 7.15, for example, you’d think the guy on my right was seriously invading my personal space – it looks like his elbow is right in my face. But actually he was probably two metres in front of me. I would probably use the camera more, but the battery is pretty hopeless (it only just lasts out for my thirty minute commute), and, more to the point, after I’d had it about a week I dropped it onto my concrete garage floor. It now rattles a lot, and whilst the pretty lights all flash away merrily it no longer appears to actually record any video. Oh well. It was an interesting experiment, but not interesting enough to make me want to splash out on a more expensive camera. Or not until I’ve carpeted the garage, at least. I became aware a little while ago of a new biscuit appearing in the supermarket aisles – although with my new enthusiasm for cheesy biscuits I wasn’t especially quick off the mark to sample some and share my thoughts with you, my dear readers. However, on a more recent supermarket trip, they again caught my eye – as they were marked with a prominent ‘REDUCED TO CLEAR’ tag. And of the two varieties placarded on the shelf only a few packets of the ‘100s & 1000s’ remained – all of the plain half-chocolate coated ones were gone. Is this just a stocking issue at my local store? Or is this a short-lived biscuit, already on the way out after failing to take the snack biscuit genre by storm? Either way, I thought I should secure one of the remaining packs to try them out. Arnott’s have been desperate to get into the ‘snack’ genre for a long time. It’s something they keep trying to do – think mini chocolate chip cookies, fun sticks, and of course tiny teddies. So just how desperate is this attempt to crack the magic ‘kids lunch box’ market? Well, I hope I’m not spoiling the surprise by answering ‘pretty desperate’. This really is a terrible biscuit. It has no style, no finesse, and no quirky styling nor unusual angle to redeem itself. But before we get to that, lets take a look at it. 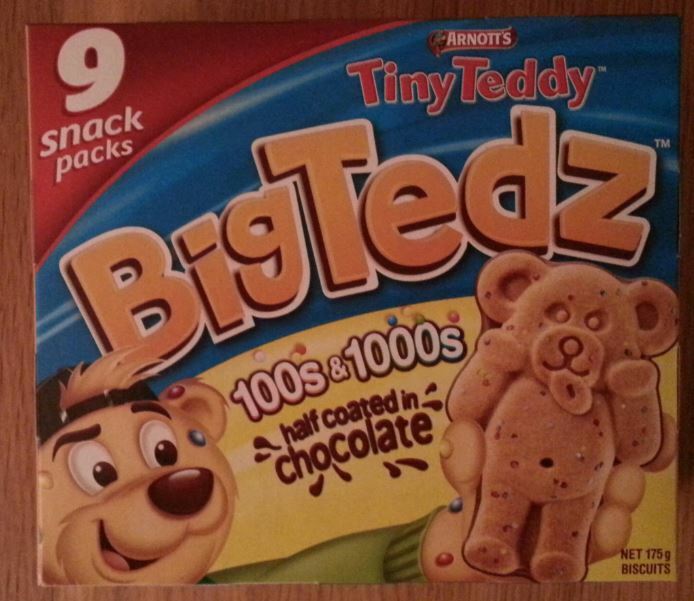 In the ‘snack pack’, you get nine individually wrapped BigTedz (and can I just say the uncalled-for ‘z’ on the end and the lack of a space in the name really doesn’t win if any marks with me either). They feature an oh-so-cool teddy character who’s favourite things are his skateboard and his hoodie (so the pack informs us). Oh dear. When you unwrap them you are presented with a fairly large, quite thick biscuit with an utterly charmless teddy bear countenance. The hundreds and thousands give it a rather mottled appearance, and the back of the biscuit is coated in milk chocolate. You will be relieved to hear this is real milk chocolate, not ‘choc’ coating. When you come to eat it, is it much harder that you expect. I suspect this is a design decision taken to prevent the biscuit disintegrating into crumbs in a boisterous child’s lunchbox, but as biscuit textures go it’s quite unappealing – not really crunchy, certainly not hard like the Ginger Nut, more just kind of dried out and stale. Despite the apparent high bake, however, it has a rather strange undercooked, doughy taste. Perhaps the use of tapioca and ‘vegetable fibre’ in the ingredients contributes to this. The 100s and 1000s do very little except add a little sugary crunch, and the whole thing gets terribly stuck in your teeth. The milk chocolate is fine, but doesn’t add anything very much – this is certainly not a biscuit that is greater than the sum of its parts (unlike the transcendent Wagon Wheel, for example). I suspect there’s a very good reason why this biscuit is fast disappearing from supermarket shelves. 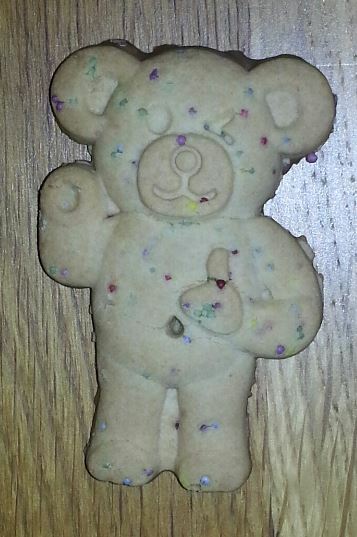 I’m not quite sure what came over Arnott’s biscuit development team when they came up with this – perhaps they were under pressure from some hot-shot marketing type who insisted that they had to have another crack at the snack market with yet another teddy variant. But I can’t help feeling they are probably all a bit embarrassed about this one, and hope it will slide into obscurity and be forgotten. Sorry folks, this one gets a one our of ten – and the ignominy of being awarded the lowest ever score for a biscuit on this blog. I have, in the past, been a vocal supporter of Conti SportContact tyres. I’ve been running the 32mm wire bead version of this tyre on the fixie (and also a tourer, whilst I had one) for many years, with huge success. They are grippy, highly puncture resistant, they roll well and last for ever. I’ve had examples of these tyres that have lasted well over 10,000km, and even when the kevlar was starts to show through the rubber they just keep going. Interestingly though, others have voiced a dissenting view – that they have found they just didn’t last long, and disintegrated on them rather quickly. Caveat emptor, and all that. I have to say, my own faith in them was temporarily shaken recently. I was riding to work, and could hear this ‘tink tink’ noise every time I used the front brake. It was clearly something on the wheel, but even though I stopped a few times to have a look there was nothing obvious – no bit of gunge stuck to the tyre than might catch on the brake callipers, and nothing on the rims. When I got to work I had a proper look, and was somewhat alarmed by what I found. The tyre was bulging off the rim, and the sidewall of the tyre seemed to be splitting. Along the split there was threads hanging off the tyre, and it must have been these I could hear hitting the brakes. Even more worryingly, when I looked around the rest of the tyre, it seemed as if similar threads were coming away all around. This was very very strange. This was the first tyre I had mounted since the bike got a new front rim. 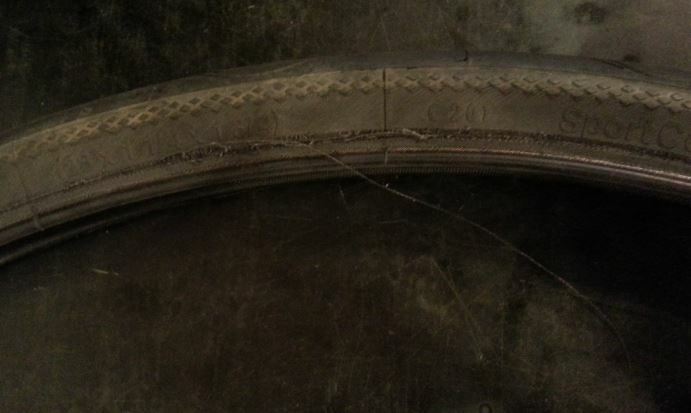 Could it be that the tyre was not sitting on the new rim very well, and it was somehow putting pressure on the sidewall? I took a look at the rear tyre, and was even more alarmed to see that it too seemed to be shedding threads. This is the original rim that came with the bike, which made the rim hypothesis rather less likely. I hotfooted it down to the LBS to get their opinion – and a new tyre, so I could safely ride home that evening. I showed it to the mechanic, and he quickly said, ‘I’ll just let the air out of that tyre before it blows up in our faces…’ He examined the rim, checked the wheel for trueness and so on, but there was nothing obviously wrong. I showed him the back tyre, and he was also a bit nonplussed, although he did point out that the tyre was pretty worn. It hadn’t really occurred to me that they were getting worn out. I guess I’ve probably ridden about 5,000km on those tyres since they were new, so compared to my previous SportContact experiences they are just broken in. I mean, you can even see a glimmer of tread pattern in a few places! I got a replacement tyre on the front (another SportContact – I’m not ready to give up on them yet). The LBS guy didn’t think the rear one was a problem right now, although he did recommend I keep a close eye on it. And then I rode home, contemplating whether getting 5Ks out of a tyre was reasonable, and/or if the stories I have heard about Conti’s quality control being a bit variable were true, and the experiences of some of my correspondents with these tyres. And then I had another thought. Around the time I got those tyres, I also got a new floor pump, as my old one gave up the ghost. It was very cheap, but seems to work just fine. However, I have always had a nagging doubt about the accuracy of the pressure gauge. At the shop, the guy had asked me what pressure I usually inflated it to, and accordingly pumped it up to 85psi using his fancy shop pump – the maximum recommended for the tyre, and what I usually do it to at home. When I got back, I attached my cheapo pump to the valve, fairly confident that the tyre was at or around 85. I put in one small stroke of air to stabilise the reading, and… my gauge only read ’60psi’. Ooops. 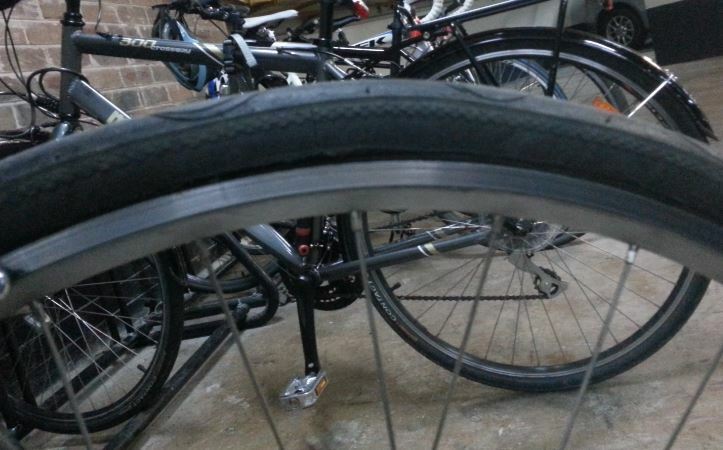 So it seems that I have been significantly over-inflating the tyre for it’s whole life. Who knows what it was getting up to, but I guess it could easily have been in excess of 100psi. Could it be that this is the problem, and that the sides of the tyres are literally cracking under the pressure? Time will tell if the new tyre lasts better now I have inflation under control, but I suppose the moral of this story is if you have a cheap pump, don’t rely on the gauge!